Tap this page for British High Commission Islamabad Jobs 2018 Apply Online Latest Advertisement. The British Government is an inclusive and diversity-friendly employer and it encourages applications from people of all backgrounds to step forward and be part of it. It does not discriminate on the basis of disability, race, color, ethnicity, gender, religion, sexual orientation, age, veteran status or other category protected by law. 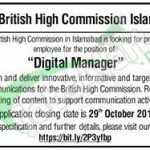 Currently, it is looking for well educated, experienced, hardworking and well-disciplined individuals for the post of Digital Manager and position is based in British High Commission Islamabad. Candidates willing to apply should have a Masters in digital journalism & new media, mass communication, Political Science, International Relations or other related social sciences degree with relevant experience to apply. For further information about job responsibilities and eligibility criteria please examine the following Online Apply link. So, those who wanted to apply for this post should apply as per the following how to apply procedure given below as per the rules of British High Commission Islamabad Jobs 2018. Candidates meeting criteria may apply online at https://bit.ly/2P3yfbp or through web link given below. Apply as soon as possible for British High Commission Islamabad Jobs 2018, which is for Masters holding relevant experience to apply. If there is any problem in understanding any information, feel free to ask us in the following comment box. Last Date to Apply: October 29, 2018.